Offshore and sub-sea environments are amongst the most demanding conditions possible for maintenance lubricants. So there is absolutely no room for performance compromise when it comes to meeting even stricter environmental standards demanded under the new VGP requirements. That is particularly pertinent to the lubrication of wire ropes and umbilicals, which are routinely used in the field for many years. Lubricants used on this equipment are expected to perform consistently for extended periods as re-application at sea is extremely challenging, and the high cost to replace corroded or damaged umbilicals during their assignment puts a sharp focus on ensuring the lubricants do their job. Total assurance that the new generation of wire rope and umbilical lubricants will tick both the operational and ecological boxes can only be delivered through real-life field testing and that’s exactly what one leading sub-sea services company has done. 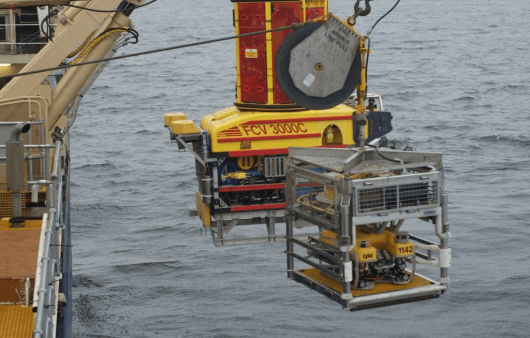 Aberdeen-based Fugro Subsea Services Ltd supports a wide range of customers operating in the North Sea, the Mediterranean and Africa. As part of a commitment to implement ecologically-sensitive solutions wherever possible whilst maintaining the performance its customers expect, the firm was looking for an ecologically sensitive and dependable solution for use on vessels. Fugro Subsea Services Ltd operates a diverse fleet of ROVs (Remotely Operated Vehicles) and vessels which are commissioned for numerous offshore projects, including underwater construction projects, sub-sea engineering, inspection, repair and maintenance of pipelines and sub-sea structures and trenching in the oil, gas and renewable markets. Fugro’s client base includes many of the major oil and gas operators and world?s largest sub-sea contractors. The company ran a trial using BIOGEN WIRESHIELD on ROVs operating from its Grampian Surveyor vessel for a three-month period off the coast of West Africa. The trial was designed to put the lubricant through its paces on umbilicals in the deepest operating waters (between 1000m and 3000m); much deeper than the 100m to 200m depths typically found in the North Sea. According to Fugro Subsea’s technical support engineer Andrew Morton, the trial results provided the assurances they sought and gave them the confidence to give BIOGEN WIRESHIELD approved product status. As an Environmentally Acceptable Lubricant (EAL), BIOGEN WIRESHIELD was developed by ROCOL specifically to meet the biodegradable definition, according to the OECD 306 test method. Prior to customer trials, product testing had already demonstrated zero galvanic reaction after 1000 hours in salt spray tests, plus shear stability in the presence of salt water with little degradation. “Using a product such as BIOGEN WIRESHIELD means we are able to greatly extend the lifetime of our umbilicals, and we can avoid any long delays for umbilical repair or replacement whilst also respecting the environments in which we operate,” said Andrew Morton.